Introducing one of our most efficient and stunning marine amplifiers, the SG-DA41400. Its True-Marine design will resist corrosion, and the incredible 1400 Watt peak power will power either four Signature speakers, or two Signature speakers and a subwoofer with ease. Dedicated channel and bridging options are also available to create your own configuration. 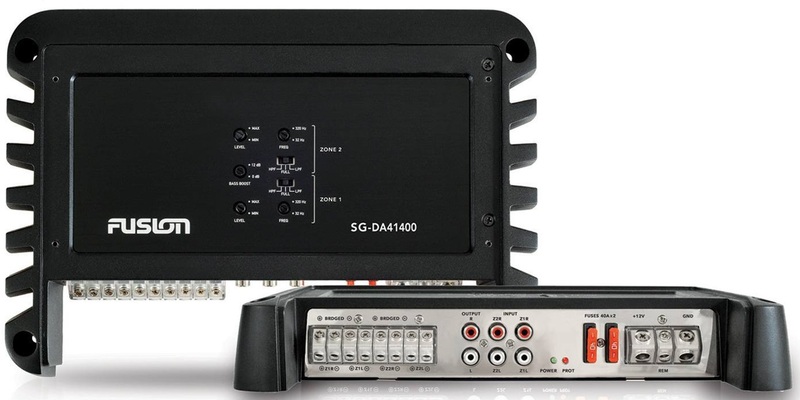 The SG-DA41400 is a 4 Channel, Class-D Hi-Fi marine amplifier. The key benefit of a Class-D amplifier is that it has a low battery drain with high output, making this the perfect amplifier for the marine environment. The SG-DA41400 also has conformal coated PCBs for maximum product life and performance, plus the amplifier chassis is a heat sink, to reduce component core temperature and increase efficiency. Undeniably a stand-out piece, the stunning stainless steel mirror control panel cover conceals and protects all cable connections and setting controls, with an attractive finish to complement any installation. The zone 1 and 2 outputs include four speaker channels plus a subwoofer. RCA line-level inputs allow for easy connection to new or existing systems. This product is rated True-Marine and carries a 3-year limited consumer warranty. Class-D Amplifier Technology - The highly efficient Class-D design provides 1400-Watts peak power whilst drawing less current than a standard Class-AB amplifier. This design provides increased efficiency and power output to your speakers, letting you enjoy your music for longer. 1400 Watts peak power - Easily power 4 speakers, or 2 speakers and a subwoofer with a peak power of 1400 Watts. Rigid Aluminum Alloy Heat Sink - Molded to form a singular die-cast chassis, the fin layout is calculated with precision to increase the surface area of the heat sink and improve heat dissipation. Stainless Mirror Finish - The polished stainless-steel control panel cover conceals and protects all cable connections and settings controls whilst providing an attractive finish to complement any installation. Speaker Configuration - Whether you require 2 Ohms per channel or 4 Ohms bridged, your Signature Series amplifier has your installation options covered to achieve the optimum output levels. Connect up to two speakers per channel at 2 Ohms, or for extra power, bridge two channels at 4 Ohms to connect two subwoofers. Zone Designation - To align with the Fusion entertainment system zone philosophy, the input and output connections are labelled as zones. True-Marine Design - Signature Series amplifiers are perfect for the marine environment, and carry a 3-year warranty.